Orbis was approached by a light rail passenger train company needing a software solution to automate testing of electric couplers and drum switches. reversible cart was used with mounting options for an electric coupler on one end oand for a drum switch on the other. After mounting either unit to the cart, the cart could be wheeled into place. Umbilical cables connected the device under test (DUT) and the test system to facilitate testing. The test system hardware was comprised of multiple instruments including a Keithly model 2400 Series Source Meter, an Associated Research model 7650 Hypot Ultra III Electrical Safety Compliance analyzer, and five National Instruments (NI) PCI Digital Input Output (DIO) cards located in a rack mountable industrial computer. Communication with the Keithley and Associated Research instruments was accomplished using an NI General Purpose Interface Bus (GPIB) card. The Orbis developed test system software included an Administrator Interface, an Operator Test Screen, a Manual Interface, a Data Viewer, and a Diagnostics Screen. The password protected Administrator Interface allowed a user with administrator rights to modify testing parameters and limits for DUT tests and self-tests. 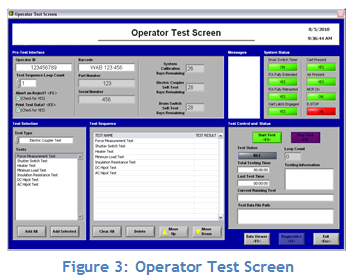 The Operator Test Screen controlled the test execution mode of the software, which included the automated testing of the electric coupler and drum switch as well as self-tests. Four main test groups (Electric Coupler Test, Drum Switch Test, Electric Coupler Self-Test, and Drum Switch Self-Test) included a series of additional subtests. For example, the Electric Coupler included tests for Force Measurement, Shutter Switch, Heater, Minimum Load, AC Hipot, DC Hipot, Insulation Resistance, Cable Loopback, Cable AC Hipot, Cable DC Hipot, Interface Test Adapter (ITA) AC Hipot, and ITA DC Hipot tests. The Operator Test screen allowed the user the flexibility to dictate a test sequence that could include all tests within a group or specify an individual test to execute. If a fault was found, the user could launch the Diagnostics Screen after test completion. The Diagnostics Screen was fed testing information for the specific fault and presented the user a series of troubleshooting steps to help further isolate the problem. The Manual Interface allowed users with administrator access to manipulate the system hardware including state control for each channel on all five DIO cards and operation of the Keithley or Associated Research instruments. The Manual Interface could be used for system verification, troubleshooting, and fault isolation during diagnostic testing. Finally, the Data Viewer was used to open and view previously saved test log files. Although the LabVIEW program for this application was complex behind the scenes, the intuitive user interfaces for each screen allowed the customer to perform their testing with relative ease.